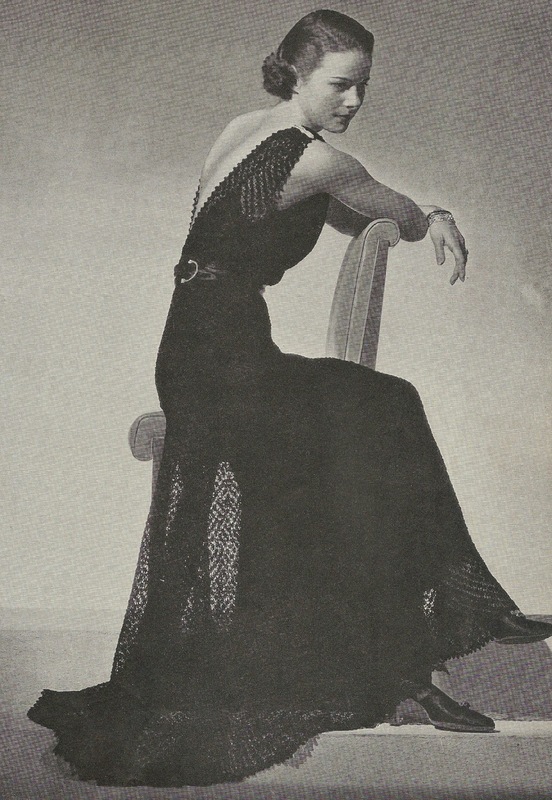 I was looking through a vintage copy of "Minerva Style Book" dated 1934 and was struck by this beautiful gown. The gown is called "Alora" and is so elegant and tasteful that it would be just as glamorous today as it was in the 1930s. In addition to the gown, there is a coordinating evening jacket that can be made in the same color or a contrasting color as shown in the illustration below. The size is listed as 16 to 18 but that was 1930s sizing, not the same as today's measurements. The finished gown would probably be a medium sized fit. The vintage Minerva Style Book has several classic ladies patterns to knit and crochet. This gown was just too special to not share! Enjoy this free ladies fashion pattern and get stitching! Simply gorgeous!!! I've never seen anything like this evening gown and matching jacket. Just stunning! This isn't crocheted. It's knitted. Love the crochet jacket! Now, I just need to learn how to knit, so that I can make the evening gown. Simply stunning!!!! I'm just come across your post as I have just finished this gown and am looking for another evening dress pattern. It is a stunning dress. I made mine for a fashion show at an Art Deco festival.